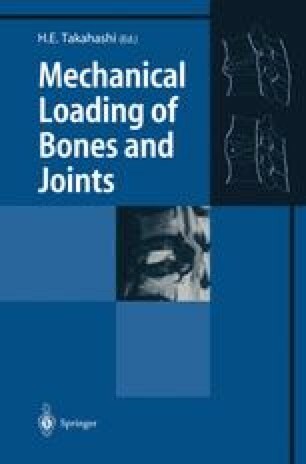 This chapter deals with the in vitro techniques for the determination of viscoelastic properties and fracture toughness of compact bone. The reliability and feasibility of these techniques have been validated through numerical simulation and experiments on bovine compact bone. The method using the split-Hopkinson pressure bar (SHPB) technique was able to sharply reduce the time required for computation to find viscoelastic parameters, and this could be an alternative method to conventional creep and stress relaxation experiments. Young’s modulus of compact bone was experimentally determined as a function of orientation applying the dynamic mechanical analysis (DMA). Young’s modulus is considered to be dominated by the microstructural arrangement of the mineral phase such as the directions of the c-axes of hydroxyapatite crystals in bone, and the previous model in terms of the unidirectional continuous fibre-reinforced composite theory was unable to obtain a good corresponding prediction to the experimental result. Fracture toughness tests have revealed anisotropic and rate-dependent behaviour in the critical stress intensity factor, K C , of compact bone. The existence of a fracture process zone due to microcrack initiation ahead of the main crack front has been demonstrated. Its contribution to the improvement of the resistance to crack growth or fracture has been discussed also. These findings have helped us to understand the optimum microstructure of compact bone as well as to develop more sophisticated biomaterials such as bone-analogue materials.